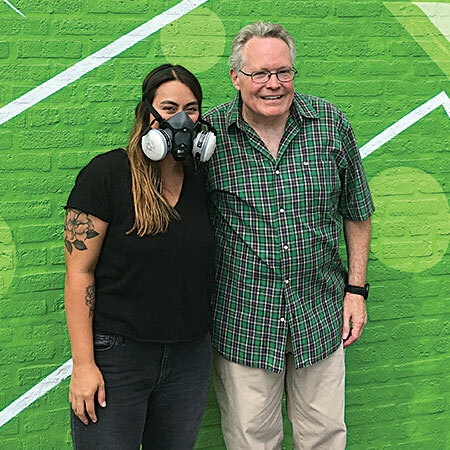 Tom O’Brien poses with the graffiti artist Miss Merlot, who wears her spray paint safety mask to protect her identity in photographs. They are standing in front of just a small portion of the building-long mural, done in shapes and patterns involving many shades of greens. 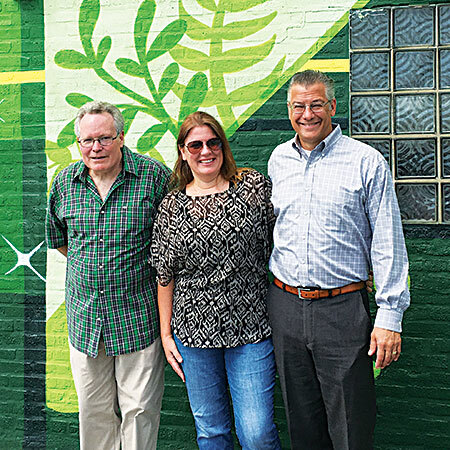 Tom O’Brien (at left), who owns O’Brien The Cleaner, stands with Berwyn Public Art Initiative board members Melissa and Rob Kowalski. Yes. You are. Lots of it. And beautiful. But it’s not money green. It’s the multi-green hues and shapes of a stylish, modern new mural. Beyond the green of profits, one drycleaning operation found out that growing green also comes in the form of local community involvement. Meet Tom O’Brien, the owner of O’Brien The Cleaner, a drycleaning business located in the near-west Chicago suburb of Berwyn, Ill., population 55,000. 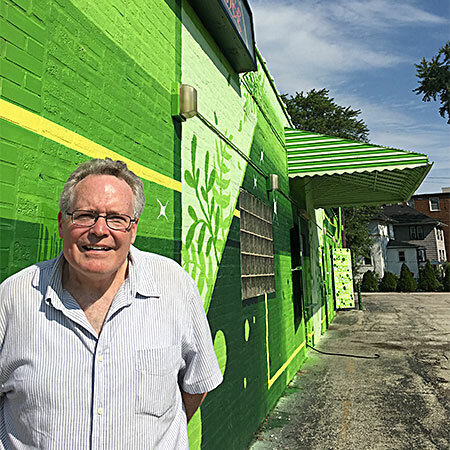 “Since January 2018, I have been working alongside the Berwyn Public Art Initiative (BPAI),” O’Brien says. The BPAI already had another artist install a mural in May a few blocks away on the other side of the commuter train tracks. O’Brien The Cleaner was next for a mural to be completed in summer. It was completed on July 23. “When BPAI representatives came to me in the winter and explained it was for the community, I was all-in,” the owner of the drycleaning business says. The artist picked for the job was a Seattle native, currently based in Chicago, who goes by the name Miss Merlot, a young woman in her 20s. This author asked her to be invited back to pose with O’Brien for a photo for American Drycleaner and she accepted. She wore her spray paint safety mask, however, to protect her identity. On a bright fall day, they stood in front of the sea of greens of the wondrous graffiti artwork adorning O’Brien’s east wall of his drycleaning plant. It’s a long building. The green is soothing, calming. BPAI board member Rob Kowalski and his wife Melissa, also a member, came by for the photos as well and were beaming about the mural. “Commuters see it, residents come by, it’s great,” Rob Kowalski relates. They express plans to do a future graffiti art project, possibly right across the big parking lot eastward, as they eye another space on a long, brick building. O’Brien grins in the autumn sun. “Ninety-nine-point-eight percent of people love it, and tell me so, and that’s pretty good,” he laughs with an Irish twinkle in his blue eyes. Being involved in the art project and living in the city makes him feel more involved in his community and more connected to his local customers, who are neighbors, too. The learning portion comes with growing in your local community, something many drycleaning owners and operators share. Community is a big part of many operations. It’s shown in participation in clothing and dress drives, charitable works, and so many other ways. O’Brien’s also sports a large bulletin board just inside the front door, covering almost an entire wall of the store, and it is overflowing, festooned you might even say, with town event notices, colorful posters, bulletins and handwritten notes of all manner, from dog-walking to bake sales to music in the park and more. It’s another way of showing that the community is vibrant and active — and so is the cleaners!